The next installment of Australia’s ‘2015 War Of The Utes’ has arrived in the all-new Nissan Navara. Sure it offers best-in-class diesel fuel consumption, matches the best for towing capacity, is handsomely styled, boasts a terrific twin-turbocharged 2.3-litre diesel engine and is very nice to drive, but Nissan’s all-new Navara needs all this and more as the competition is mounting like never before. Just a few weeks back, not long after we drove the updated Ford Ranger, we drove the all-new Mitsubishi Triton range. On the horizon is the updated Mazda BT50 and looming large over all of this, in the final quarter of this year, is the all-new Toyota HiLux which we previewed a week ago. But for Nissan it’s simple - there is no more important vehicle than the Navara as it represents 30 per-cent of the company’s new vehicle sales in Australia. No wonder Nissan Australia’s product planners have been working tirelessly with their colleagues in Japan and Thailand to tick-off every nut, bolt and washer. And, as we now know, there is a global focus on this all-new Nissan Navara…with a never-before-seen twist. Thanks to global alignments, this is the vehicle which will underpin the historic first-ever mass production pickup truck from Mercedes-Benz. Seems the ute war is only just warming-up. Actually the product planning function for utes is a nightmare with so many different configurations to meet varying needs. The all-new NP300 model Nissan Navara has arrived with no less than 27 variants, three engine types and two transmissions. Because the inarguable fact is buyer expectations in this segment have changed dramatically in the last few years. Yes utes are still primarily working vehicles but recreational/family pursuits now dictate a shift to four-door crew cab configurations plus more passenger car features and driving dynamics. Global scheduling has put Nissan’s plant outside Bangkok, Thailand under pressure so at this stage only the dual-cab models (14 variants) have arrived downunder. Expect single-cab versions of the all-new Nissan Navara in local showrooms before the end of the year. 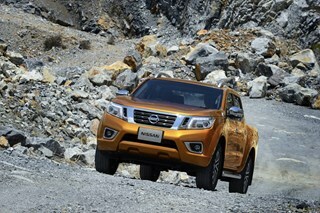 The range kicks-off with the Nissan Navara DX 2WD at $26,490 and the range-topping ST-X 4WD will set you back $54,490. And as usual with utes, there is a massive array of different specifications – first complexity is only ST and ST-X model Nissan Navaras get the all-new new-turbo diesel engine (2.3-litre single turbo diesel for RX and the 2.5-litre petrol powerplant for DX). Here’s more: over DX and RX grades, Nissan Navara ST picks-up key additional feature such as 16-inch alloy wheels, reversing camera, NissanConnect smartphone integration and a colour five-inch audio display, leather seats, steering wheel and gear-lever, LED DRLs and projector headlights, front fog lights, and side steps. Range-topping Nissan Navara ST-X gets all that and more with extras including 18-inch alloy wheels, eight-way electronic adjustment for the drivers’ seat, satellite navigation, push-button start, carpet floor mats, reversing sensors, and heated door mirrors with integrated LED turn signals. Not surprisingly the star of the show under the bonnet in the all-new Nissan Navara is the YS23DDTT 2.3-litre twin-turbo four-cylinder diesel. This engine is exclusive to Nissan Navara ST and ST-X models. Maximum power is 140kW at 3750rpm while peak torque of 450Nm is delivered between 1500rpm-2500rpm. Turning to combined-cycle fuel consumption we see 6.3l/100kms (manual) and 6.8l/100kms (automatic) for two-wheel-drive or 6.5l/100kms (manual) and 7.0l/100kms (automatic) for the 4WD. Also available is a single turbocharged version of this engine offering 120kW of power at 3750rpm and peak torque of 403Nm between 1500rpm-2500rpm. For combined-cycle fuel consumption for the 2WD model you can chalk-up 6.4l/100kms (manual) or 6.9l/100kms (automatic) and for the 4WD it’s 6.6l/100kms (manual) and 7.1l/100kms (automatic). Entry level Nissan Navara DX 4x2 is exclusively powered by the QR25DE 2.5-litre four-cylinder petrol engine which is good for 122kW of power at 6000rpm and peak torque of 238Nm at 4000rpm. Combined-cycle fuel consumption is rated at 9.9l/100kms (manual) or 9.7l/100kms (automatic). All drive via either a six-speed manual transmission or a seven-speed automatic. Models with 4WD score Nissan’s excellent dual-range system with electronic selection. Braked towing capacity for all Nissan Navara diesel models matches the best-in-class at 3.5 tonnes. Nissan’s designers have left no stone unturned in their quest to make the interior of the all-new Navara as car-like as possible. From design and positioning of the A-pillars and exterior mirrors to seat torso angles and instrument shapes and orientation, the needs of those inside the Navara have been uppermost in the design process. Nissan enthusiasts may even see a hint of the Nissan Altima in interior style of the all-new Navara. A nice touch which those who drives utes a lot will appreciate is the power-sliding panel in the rear glass (RS, ST and ST-X models). As well as providing access from the cabin to the tub, this feature also certainly improves cabin ventilation. ST and ST-X models feature leather-trimmed seats and leather-wrapped steering wheels and gear levers. Range-topping Nissan Navara ST-X also picks-up electronic seat adjustment for the driver, satellite navigation, a sunroof and dual-zone climate-control air-conditioning. Comfort up-front is excellent (‘Spinal Support Front Seats’ claim to be better for your back) and despite the lack of reach adjustment for the steering wheel, the driving position is good. Those in the second row are reasonably well catered for although, like the previous model Navara, we reckon the non-adjustable seat back is a bit too upright for comfort in long journeys. Well Nissan has thrown away the Navara styling manual it seems. Or to put that another way – while the previous generation Navara looked very much like an evolution of its predecessor, the all-new NP300 lineup is totally new and we must say has a commanding on-road presence. Up-front you’ll notice Nissan’s new ‘V-Motion’ grille, grade-specific lighting and a powerful arch for the bonnet. Side view sees some nice curves and a slick blending to the tub area. At the rear all-new Nissan Navara features a unique rear spoiler on top of the tailgate. Nissan says it serves no aerodynamic purpose but tradies will find it handy to rest their coffee cups or cold ones. As part of its extras, range-topping Nissan Navara ST-X runs an alloy sports bar, roof rails and a sturdy tub liner. And we liked the standard two-channel ‘Utili-Track’ system which is standard in the ST-X tub. The system uses two channels and four heavy-duty aluminium cleats which can be secured anywhere along those channels – now that’s load-carrying versatility for you. Entry-level Nissan Navara DX rides on 15-inch steel wheels and it’s 16-inch steel wheels for RX models. Nissan Navara ST steps-up to 16-inch alloy wheels while the sporty ST-X scores handsome 18-inch alloys. Nissan is justifiably confident about the all-new Navara – unusually these days for the national media preview the Japanese giant actually turned-down the expected ‘talk-fest’ and ramped-up the ‘seat time’. So we’ve just spent over 400kms behind the wheel of various Nissan Navara models both in Adelaide and the Adelaide Hills and off-road in the Gawler Ranges National Park. Of course drive impressions were dominated by the all-new 2.3-litre twin-turbo diesel engine. We can confirm Nissan’s new powerplant is a beauty which delivers its abundant 450Nm across a broad rev range and matches the best of the Europeans for quiet, vibration-free operation. Naturally part of that story was clever matching to the seven-speed automatic transmission. You could mount a case that downchanges in the manual mode were a tad too slow but hey, this is a pickup not a sports car. All-new Nissan Navara NP300 dual cab models feature a cleverly designed five-link independent rear suspension. So, not surprisingly, comparisons of the ride and handling of these models to the outgoing Navara are like night and day – over those South Australian roads and tracks, the all-new NP300 exhibited refinement, balance and cornering precision which leave its predecessor in another era. Compared to the segment-best Ford Ranger/Mazda BT50 and even the all-new Mitsubishi Triton, the Nissan Navara turned-in and matched their mid-turn balance but showed just a smidge more bodyroll. Around town the all-new Nissan Navara was impressively quiet and refined and scored bonus points over the previous generation with increased maneuverability thanks to a smaller turning circle (11.8-metres for DX and RX models and 12.4-metres for ST and ST-X). Nissan was at lengths to note the passenger car creature comforts of the all-new Nissan Navara which leaves us perplexed why there is no reach adjustment for the steering wheel – the all-new Mitsubishi Triton has it. And, as we’re told these vehicles are increasingly used for family vehicles, the lack of ISOFIX child restraint anchors in the all-new Navara’s rear seat is an omission we can’t explain. Here’s the thing local politicians and other eco zealots don’t get: ute sales are booming because - unlike oh, let’s say communal shared bicycles – pickups fit today’s busy lifestyles. Many ute buyers work in the private sector or are self-employed: these vehicles help them do their jobs during the week and enjoy family recreation on weekends. It’s simple - while the daydreaming greenies talk about bicycle lanes and public transport, in the real world where people work and are time-poor, Nissan has delivered a vehicle with a 3.5-tone towing capacity, 1106-litre carrying capacity and fuel consumption of 6.3l/100kms. Like the HiLux, Ranger/BT50, and Triton, all-new Nissan Navara is just so all-round efficient…well, the case for utes is closed without argument. And, as per those new arrivals – and unlike its previous generation – the all-new Nissan Navara is comfortable and spacious inside and refined to drive. Obviously influenced by the performance of that twin-turbo diesel, the all-new Nissan Navara is a vehicle we’d happily own permanently. So if you’re buying a ute, this one must be at the top of your shopping list. Of course many will give the all-new Nissan Navara star billing purely on the basis of its sharp prices...but the ute battle has many fronts and this time the Nissan Navara is on the front line in every department. Our favourite in this league remains the just-updated Ford Ranger. You’ll need just a little more coin (Range XL Double Cab petrol starts at $30,240) but we score the locally engineered and developed Ford Ranger at the front of the pack for driving dynamics. Of course only minor specification and styling changes differentiate the Ford Ranger from the Mazda BT50 so it’s also at the top of the ute ‘totem pole’. And we have to say the all-new Mitsubishi Triton has leapt into second on our ladder (a ranking it now shares with the all-new Nissan Navara). As always you do need to carefully cross-reference different specifications to get the true value comparison between models but we can say with confidence the all-new Mitsubishi Triton is a ‘kazillion’ per-cent better than the dated previous generation and ranks very highly with us for interior comfort thanks to its rake/reach adjustable steering wheel (incredibly still a rarity in utes). And you absolutely must put the Isuzu D-Max on your list. Tough and powerful, the Isuzu D-Max will surprise you with its world-class quality, great driving dynamics and all-round ability. We’re excluding the Toyota HiLux from comparisons because we’re waiting for the all-new model range to be launched. Let’s just say there is no more important vehicle for Toyota in Australia so expect the all-new HiLux to be a ripper.